Or 6 payments of $17.50 with What's this? 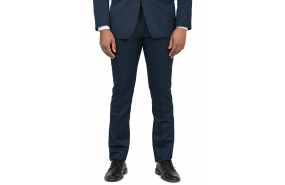 Timeless and versatile, the Gilmore Suit Trousers will quickly become a favorite of your wardrobe when paired with it's matching jacket for a formal look - or even just on their own during the working week. Or 6 payments of $35.00 with What's this? The Gilmore Suit is a solid classic, and always an essential part of every wardrobe. It has a modern fit to enhance your natural shape. Add a white shirt for a fail proof formal look or experiment with prints and colour - as this suit will easily take you from one occasion to another.